Nokero will be showcased this year as Seoul Semiconductor’s solar product partner at LightFair International 2014 in Las Vegas, Nevada. Nokero’s solar light bulbs use Seoul Semiconductor LEDs to provide light for the 1.3 billion people without access to electricity. Nokero's brand new N182 is not yet available to the public, but samples will be handed out by Seoul Semiconductor at LightFair International 2014. Nokero will be showcased this year as Seoul Semiconductor’s solar product partner at LightFair International 2014 in Las Vegas, Nevada. Together, the two companies demonstrate that LEDs do not just provide lighting, but can actually change the world. Nokero’s solar light bulbs use Seoul Semiconductor LEDs to provide light for the 1.3 billion people without access to electricity. Nokero’s CEO, Steve Katsaros, says: “The ultra-efficient Seoul mid-power 5630 LED is a game-changer for our solar light bulb. Every 5% of improved efficacy means either 5% longer run time or a 5% increase in brightness. I commend our partners at Seoul Semiconductor for bringing the world's best LEDs to the market, which in turn enable products like the Nokero solar light bulbs to change lives at the base of the economic pyramid." Nokero chose to use Seoul Semiconductor’s 5630c LEDs (STW8Q14C) due to their affordability and high efficacy. In many scenarios, ranging from outdoor recreation to third world development, Seoul Semiconductor’s LEDs provide maximum brightness for Nokero’s solar lights. Inspired by the familiar shape and function of the light bulb, Nokero’s patented designs emphasize ease of use and efficient energy conversion with solar panels and powerful LEDs. 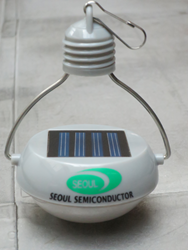 Nokero and Seoul Semiconductor are excited to come together at LightFair this year offering the new N182 solar lamp to Seoul Semiconductor booth visitors. Visitors to LightFair should be sure to stop by the Seoul Semiconductor Booth (#5830) to receive a sample Nokero light, free of charge. Nokero International Ltd. lights the way to a better quality of life and economic opportunity for those without electricity. Nokero’s name originates from the phrase ‘No Kerosene’ – evoking its mission to replace this harmful and polluting fuel with safer, environmentally friendly solar light solutions. Founded in 2010 by inventor and CEO Steve Katsaros, Nokero is a privately held company headquartered in Denver, Colorado, USA with offices in Hong Kong and Kenya. Today, Nokero has distributed over 1,000,000 solar light bulbs to more than 120 countries. Seoul Semiconductor manufacturers and packages a wide selection of LEDs for the automotive, general illumination/lighting, appliance, signage and back lighting markets. They are the world’s fifth largest LED supplier, holding more than 10,000 patents globally, while offering a wide range of LED technology and production capacity including Acrich2 AC driven LEDs, Acrich MJT LEDs, mid-power LED and many others. Seoul’s 5630 mid-power LED package has proven to be their ‘MVP’ in the mid-power family given it’s best in class efficacy at 160 lumens per watt at 60mA. This widely compatible package reduces system costs and provides fixture-to-fixture color consistency perfectly suited for a wide range of applications including Nokero’s new solar light.